Tim Burton’s stop motion animation is precise and gorgeous. Inspired by the holiday specials of his youth, Burton brings a beautiful joy to characters designed to be seen as frightening. In The Nightmare Before Christmas, Jack Skellington is the Pumpkin King; the best and scariest creature at Halloween but he longs for something different. Wandering away from the post Halloween celebrations, he lyrically ponders his yearly routine and the possibilities of a wider world. When he falls into Christmas Town, his delight at the new experience is delightfully punctuated by an excited and frenetic rendition of a song titled “What’s This?” in which he explores new delights from snow to electric lights. He tries to share his newfound joy with the monsters of Halloween Town but soon realizes that they want the familiar scares. His delight sends him on a whimsically, ill-advised plot assisted by a trio of Trick or Treaters and a Frankenstein’s monster-like rag doll with an overbearing maker and his ghost dog, Zero. The music of The Nightmare Before Christmas is infectious. Jack is voiced by Chris Sarandon with his singing voice provided by the music’s composer, Danny Elfman. There are a number of visual callbacks to Burton’s earlier work in Beetlejuice in the visual appearance of some of the monsters, especially the snakes that wind themselves through toy boxes and a band that appears briefly to take instruction from Jack as to their role in the Christmas takeover. Burton’s movies are a return to childhood for adults and something they can feel confident sharing with the children. There is an elegance in the darkness of the story and an innocence that viewers will appreciate in holiday viewing for the family. In “Making Christmas,” the Halloween townspeople banding together show a spirit of cooperation and teamwork that they might not understand and may be struggling with but their heart is in it and that sentiment reads to children while entertaining adults. The best thing about The Nightmare Before Christmas is Burton’s dark humor. Most of the chuckles are as a result of Jack’s misunderstanding of the world he’s emulating. “You don’t have claws at all!” he marvels to “Santy Claus.” It’s perhaps redundant to call a skeleton wide-eyed but Jack’s struggle to embrace something he never truly comprehends is delightful. His later appearance as Father Christmas is reminiscent of the Death’s turn as the Hogfather. Zero’s nose glows and he leads the sleigh in homage to perhaps Rudolph or the Grinch’s dog, Max. 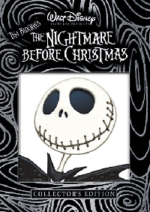 If you’re looking for a new holiday classic, pick The Nightmare Before Christmas up today. My daughter adores the movie as well as Burton’s “Corpse Bride” so we watch them several times a year and they never get old. Trust me, we all need a little Jack Skellington in our holidays.